This is a sponsored post written by me on behalf of RedEnvelope. Being a mom is hands-down the hardest thing I have ever done. I’ve been doing it for a little over six years now. I may not be as seasoned as all y’all but I do have plenty of those true MOM moments where you know you deserve like a million dollars just for being a Mom. I was thinking about the most recent MOM moment. It occurred on a family trip to San Diego we just took. Road trips with small children are probably just one long MOM moment, but this one was especially hard. We drove to San Diego and got delayed a day due to a freeway closure (yes–police hostage situation, yikes!) Finally when we got to our hotel, there was NO WATER in the hotel room. As a mother of littles, water is an absolute necessity. I could have handled broken air conditioning or TV or something but water?! It was awful. We couldn’t flush the toilet or wash our hands and after sitting in the car and dealing with sticky children, I needed some serious hand washing. After arriving, my husband had to immediately go to his class. That was the reason for our trip–my husband was taking a class for his job. 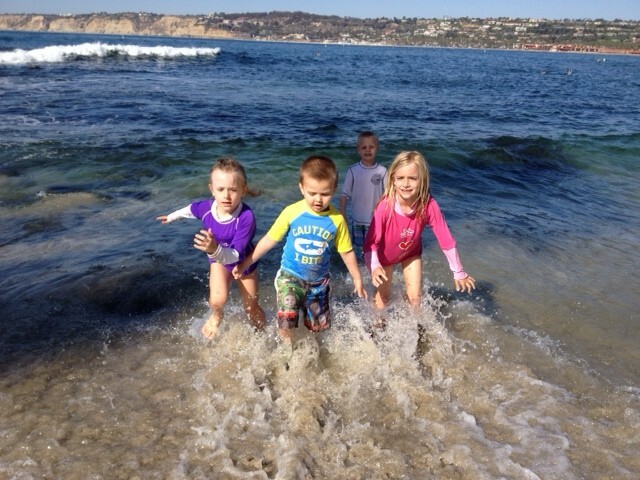 So yes, it was just me and my three kids for the rest of the week. The next day (the water finally came on!) we spent the day at the beach where my daughter is terrified of the ocean and cried for nearly the entire first hour we were there. 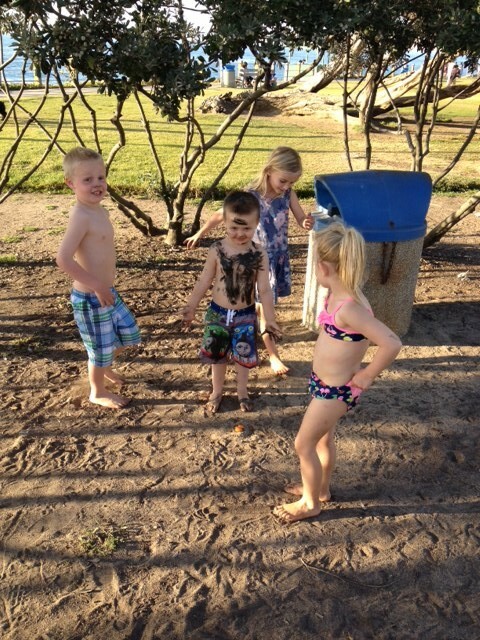 Later that day a friend joined us and my 4-year-old decided to drop his pants and tinkle on the trees next to her. Then he covered himself in mud, literally. After an hour of scrubbing kids clean, feeding them, and getting them to bed, I was ready to pass out. That was my latest MOM moment. I have better stories, but being the exhausted, barely human woman I am right now, I can’t remember them. The point is that being a Mom is so dang exhausting, frustrating, emotional, etc etc etc. I could list all the synonyms for ‘tired’ but you get the point. But there are those wonderful rewards you receive from your kids like hugs and kisses and wonderful expressions of love. And that really does make it all worth it. But every mom also needs to feel like an actual person sometimes beyond Motherhood. That’s where RedEnvelope comes in. RedEnvelope is this amazing site where you can sit back with cold drink and shop from the comfort of your couch. You can browse the unique and high quality products they carry and then pick something out that you would like to treat yourself to. Because you are a mom, and that deserves a reward once in awhile. I decided to treat myself to this beautiful bag. I am such a sucker for this color and I didn’t have a bag in aqua. But now that I have this bag and it’s the color of the ocean, it will remind me of that wonderful (albeit hard) day at the beach with my kids. And those memories are one of the best kinds of rewards for Motherhood. And look at the pretty packaging! I’m not giving you an excuse to go max out your credit card, but rather permission for you to actually allow yourself to think of YOU and only you. Mothers spend 99% of their brain space thinking of their children and others and so many of us forget that we need to feel good too. Remember that old adage “if Mama ain’t happy, ain’t nobody happy.” So what better way to have a happy family than to make yourself feel pretty, pampered, important, clean, special, relaxed, etc? But if you do need a reason to splurge a little, make a list from RedEnvelope and send it in a not-so-subtle email to your husband. So what was your best MOM moment? 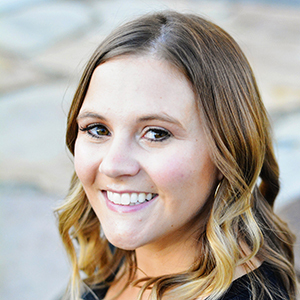 And why do you deserve a gift from RedEnvelope? 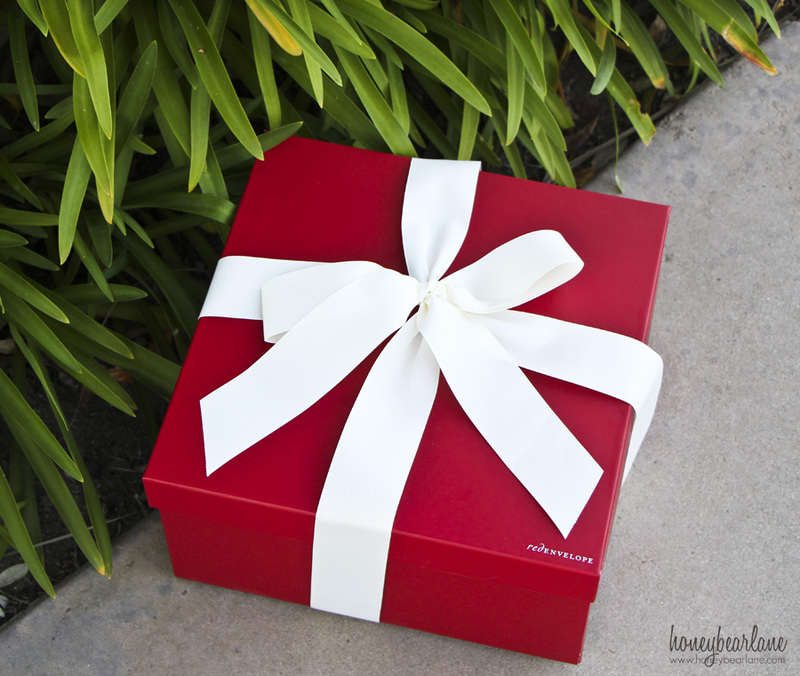 There are tons of mother’s day gift ideas to be found on RedEnvelope, and it comes in a beautiful red box, all wrapped and perfect. It will make any mother feel super special! 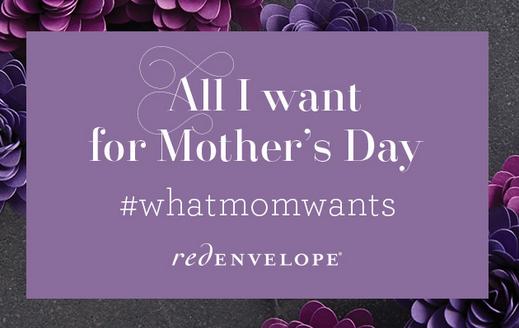 For more RedEnvelope products, visit our Pinterest board What Mom Wants. Download the graphic below and email it to the person of your choice with a link or links to what you want from RedEnvelope this Mother’s Day. You’ve earned it! And as an added reward for all you moms out there (even moms to be!) enter the giveaway below to win a $500 gift card from RedEnvelope! The giveaway will be open on Wednesday April 30at 12:01am PT and end May 7, 2014 at 11:59pm PT. Three winners from 20 giveaways will be selected to receive a $500 RedEnvelope gift card. I would order the coin pearl station necklace, the cashmere tank + short set, the picnic backpack, the acacia wood entertaining tray set, the you wash, i’ll dry kitchen towel set, and the personalized leather family story photo album. Hmm..I might get some hand stamped necklaces with my kids names, or maybe some wall art. I’d love to get my mom something she can use to pamper herself. She’s had a difficult year, and I’d love to be able to do something special for her. The spa gifts looked wonderful. I’d order flower or a robe. While I especially love the fiddle ring (I love that it can be inscribed inside), I’d take any of the rings or jewelry! I would order some of their beautiful pillows! I like the luck/good fortune family necklace. I would buy the picnic backpack, love it. I’d order a clutch – I’m expecting my second, and I remember that with my first, I just threw my wallet into the diaper bag, but then if I ever had an occasion to go out without the babe, I had to scramble. So it would be nice to have a clutch handy. LOVE the hall gallery frame set and capresso espresso machine. 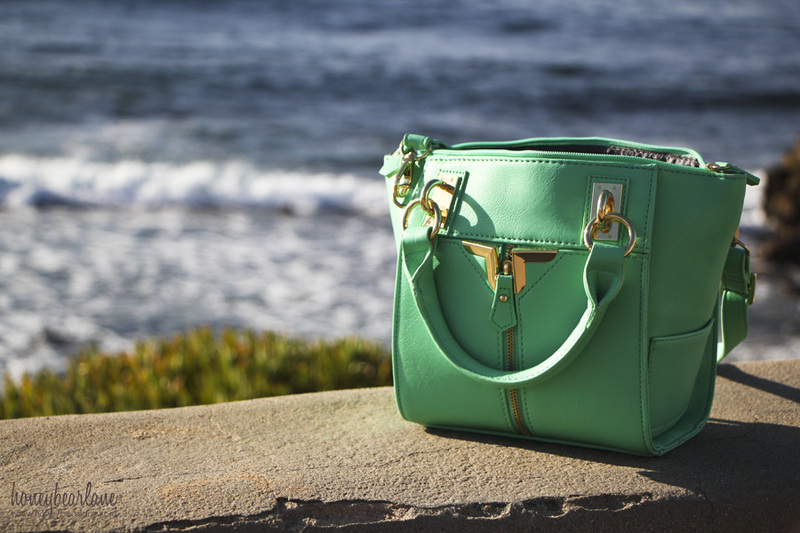 I would order the Daniella Nicole Crossbody in Aqua. Love it! 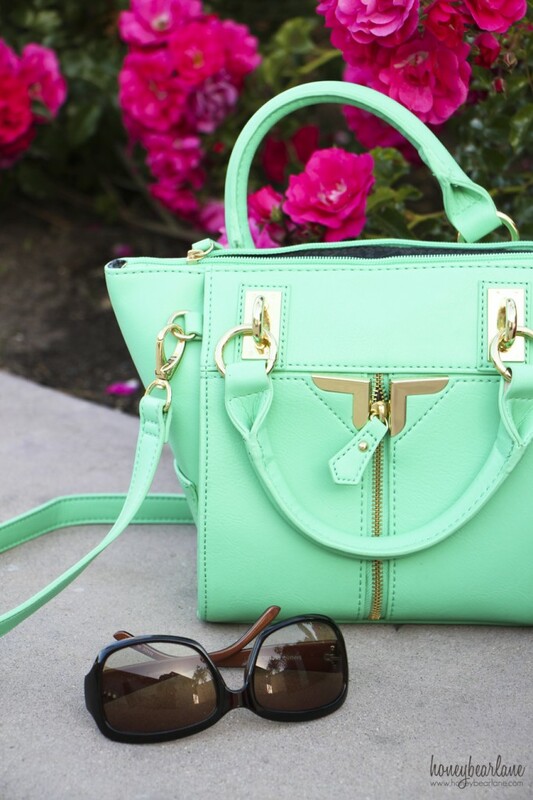 I love that aqua bag! It’s gorgeous! I really like the smart phone wallet, so easy to find both as it seems I am always digging in my purse for my phone! I would give my mom the mabel chong keshi pearl earrings and customizable wall art. I would get the mixing bowls. Heidi I love your aqua bag, thanks for this opportunity. The packaging is to die for but that color and style!? I’m a sucker for the unique styling of a bag and that bag just wraps it all up…jackpot. Nice! Always at a loss to get my mom! Lovely items on this site. The Mom bracelet in sterling silver caught my eye and made my list. Thank you! I am a mom, but my mom is now with her Father in Heaven, but I have many, many memories of her. I have never been to the Red Envelope site, but I am headed there right after I send this note. Have a great weekend! I would get a necklace for my mother and mother in law! Pillows for the bed and a purse for me! i would love to treat myself to some jewelry, like the stacking birthstone ring! I would start with some glass garden globes and plants.